Observing the past and present through the eyes of someone sliding into the depths of Alzheimer’s might not sound appealing. Here, it’s more than appealing: it’s impossible to put down. Dr. Jennifer White, a surgeon, is a “person of interest” in the death of her best friend. She has no memory of the incident. Or perhaps she does. A gripping mystery, an absorbing study of a family in crisis, and a wrenching look at a mind struggling to overcome its increasing limitations. 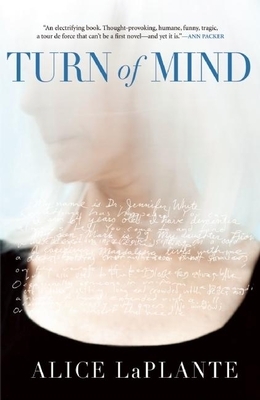 A stunning first novel, both literary and thriller, about a retired orthopedic surgeon with dementia, Turn of Mind has already received worldwide attention. With unmatched patience and a pulsating intensity, Alice LaPlante brings us deep into a brilliant woman's deteriorating mind, where the impossibility of recognizing reality can be both a blessing and a curse. As the book opens, Dr. Jennifer White's best friend, Amanda, who lived down the block, has been killed, and four fingers surgically removed from her hand. Dr. White is the prime suspect and she herself doesn't know whether she did it. Told in White's own voice, fractured and eloquent, a picture emerges of the surprisingly intimate, complex alliance between these life-long friends--two proud, forceful women who were at times each other's most formidable adversaries. As the investigation into the murder deepens and White's relationships with her live-in caretaker and two grown children intensify, a chilling question lingers: is White's shattered memory preventing her from revealing the truth or helping her to hide it? A startling portrait of a disintegrating mind clinging to bits of reality through anger, frustration, shame, and unspeakable loss, Turn of Mind is a remarkable debut that examines the deception and frailty of memory and how it defines our very existence.